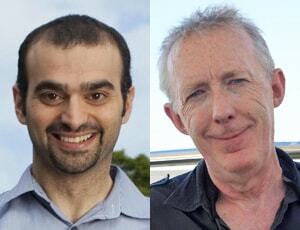 Professor Bryan Gaensler (left) and Professor Peter Goodyear (right) have been awarded Australian Laureate Fellowships. Two University of Sydney academics have been awarded prestigious Australian Laureate Fellowships by the Australian Research Council (ARC). Astronomer Professor Bryan Gaensler, based within the School of Physics and Professor Peter Goodyear from the Faculty of Education and Social Work are among 15 researchers to be awarded a fellowship under the Australian Laureate Fellowship Scheme. The scheme is designed to support excellence in research by attracting world-class researchers and research leaders to key positions and creating new rewards and incentives for the application of their talents in Australia. Professor Gaensler will use his fellowship grant to help demonstrate the viability of technologies that could be used in the Australian Square Kilometre Array Pathfinder (ASKAP), the world's most powerful radio-telescope. His project proposes to dramatically improve our understanding of the nature and origin of magnetic fields using the unique capabilities of the ASKAP. With the resulting data, Professor Gaensler aims to transform our understanding of magnetic fields in galaxies, clusters and in diffuse intergalactic gas and thus be able to address key unanswered questions on Milky Way ecology, galaxy evolution and cosmology. Professor Gaensler has received many awards for his research including the Young Australian of the Year, an Alfred P Sloan Research Fellowship and the Newton Lacy Pierce Prize awarded by the American Astronomical Society. He was named a 2008 Young Tall Poppy by the Australian Institute of Policy and Science. Professor Peter Goodyear will focus on strengthening the University's Centre for Research in Computer Supported Learning and Cognition (CoCo) with seven additional positions. His fellowship is the first to be awarded to a researcher working in the field of education. CoCo was created in 2004 as a focus for the University's research in learning technology and the learning sciences. It is located in the Faculty of Education and Social Work and supports cross-disciplinary collaborations with teams in IT, Engineering and Science. According to Professor Goodyear, this investment will accelerate work on the analysis and design of complex learning environments. "CoCo has a reputation for cutting edge research on educational design and we attract academic visitors and PhD students from around the world," he said. "Funding from ARC will also help us firm up our links with other leading research groups in the Asia Pacific region."